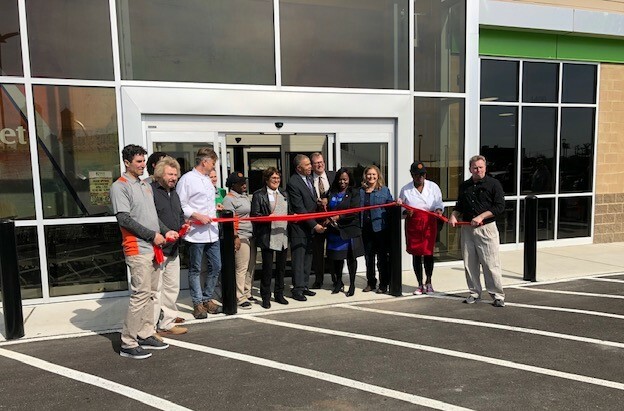 Staff and owners from GreenLeaf Market, representatives of the City of St. Louis and NorthSide Regeneration, and many other supporters gathered under a white tent on April 1 to commemorate the long-awaited opening of GreenLeaf Market in the NorthSide Regeneration footprint. The 20,000-square-foot grocery store is located at the corner of Tucker Boulevard and 13th Street in north St. Louis City. A ribbon cutting at the event marked the grocery store’s soft opening. GreenLeaf will be open 10 a.m. to 4 p.m. until the grand opening on April 13, which will start the normal store hours of 7 a.m. to 9 p.m., Monday through Saturday, and 9 a.m. to 8 p.m. on Sunday. The grand opening celebration will feature free samples, a “fill-a-basket” food drive for needy families in the community, and drawings for free groceries. Giveaways will also be held for free gas and car washes from the new ZOOM Convenience Store across the street. GreenLeaf Market is locally owned by St. Louis Grocery Group, in partnership with Good Natured Family Farms, a cooperative alliance made up of 150 family farms located in Missouri, Illinois and Kansas. The market features locally- and regionally-grown produce and meats and a wide array of unique items that shoppers won’t find at other grocery stores. The store also features a state-of-the-art kitchen managed by an experienced, on-site chef focused on creating farm-fresh, nutritious and fully-prepared grab-and-go food selections. GreenLeaf Market, which created 72 full- and part-time job opportunities for local residents, plans to offer convenient curbside pick-up for online orders to better serve the needs of commuters and people working downtown. Good Natured Family Farms co-owner Diana Endicott said she plans to replicate the success of her business in the Kansas City area in St. Louis at the new GreenLeaf Market. “Here we are today, after many years of planning and reaching out. We hope to do the same thing to utilize some of the farms that we currently have, but have also spent two years of research, sponsored by the USDA, to locate farms around this area that would be able to bring fresh produce and meats, cheeses and honey. We also want local artisan products, handcrafted products, to be able to help them come to the marketplace,” she said at the ceremony. Dr. Katie Plax, Medical Director at The Spot, a center devoted to the health and well-being of St. Louis City youth ages 13 to 24, spoke at the ceremony about the physical and mental health benefits young people in the community will realize by having GreenLeaf Market in their neighborhood. “GreenLeaf to me is the green sprout of a brighter future ahead for the northside of St. Louis and those who live and work here. To healthy kids and families to chronic disease prevention and treatment, to system and policy change to reduce hunger and to powerful collaborations for a mission that better serves our community, we celebrate,” said Dr. Plax. For more information about GreenLeaf Market, visit www.GreenLeafMarketStl.com.